A rapidly moving yellow fever virus that has killed thousands of brown howler monkeys in Brazil may be creating an opportunity for the monkeys' critically endangered competitor. 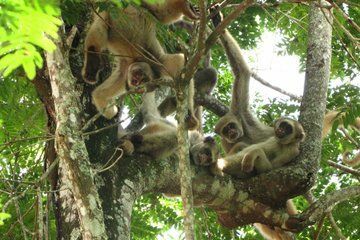 Researchers are now studying how the northern muriquis, or woolly spider monkeys (Brachyteles hypoxanthus) — sometimes called hippie monkeys for their peaceful egalitarian societies and affectionate hugging — are adapting in parts of the Brazilian Atlantic Forest now that the more abundant brown howlers (Alouatta guariba) have been devastated by disease. Muriquis are apparently less susceptible to yellow fever than brown howler monkeys. While thousands of the latter species have succumbed to the yellow fever outbreak since late last year, most of the muriquis studied by Strier and her colleagues seem to be surviving. Since January, the researchers have identified 302 muriquis in their study area, a reserve in southeastern Brazil called RPPN Feliciano Miguel Abdala. In the 2016 study season, they tracked 340 muriquis. The story for the howler monkeys isn't so cheery. Their booming calls no longer echo through the forest, Strier said. Researchers don't yet understand how yellow fever has spread so rapidly through Brazil's Atlantic Forest, which has been fragmented by deforestation. "I am very surprised at the speed with which the outbreak is advancing through the landscape and by how the virus can jump from one patch of forest to another, even if they are hundreds of meters apart," Strier's collaborator, Sérgio Lucena Mendes, a professor of animal biology at the Universidade Federal do Espírito Santo, said in the statement. The epidemic, however, has opened up a new opportunity to understand what happens to one species when its competitor is wiped out — a crucial question in an era when extinctions are happening so rapidly that some researchers think the Earth is in its sixth mass extinction. Scientists have been tracking monkey populations at RPPN Feliciano Miguel Abdala for more than 30 years. That historical data can be compared to the monkeys' current behavior to better understand how they respond to major disruptions. "We are in a position to learn things we never knew before, with all the background information that we have collected," Strier said. Thirty-four years ago, there were only 50 muriquis in the reserve area, a number that rebounded when the primates were protected in the 1980s (in part, due to the research and advocacy of Strier and her colleagues). As their population size has changed, the muriquis have altered their behavior, Strier has found, splitting into smaller groups in the 1980s and 1990s and spending more time on the ground eating fallen fruits than in trees foraging. The near-disappearance of the muriquis' competitor for food, the brown howler monkey, may alter their behavior yet again. "I have so many questions that are important to answer, for the primates, their Atlantic Forest habitat, and for the people that share their world," Strier said. As for the brown howlers, Strier is optimistic that yellow fever won't be the end of their reign. "The muriquis have shown us that it's possible for small populations of primates to recover, if they are well-protected," Strier said.